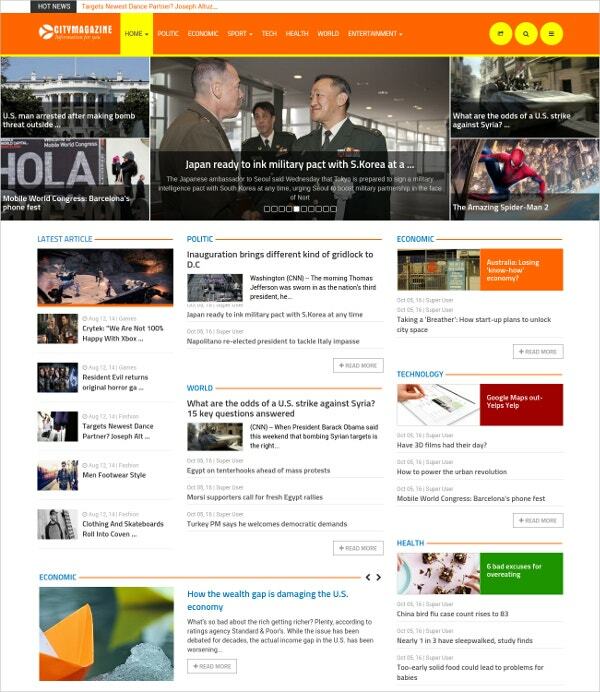 Professional news outlets need a professional website, and News delivers. Whether your organization covers local news or worldwide events, this informative template offers the range of options you require. Build a modern website with this responsive Magazine Joomla Template for websites. Besides, you can use more options and easy to control or edit news on your blog. It makes your website more convenient to use. 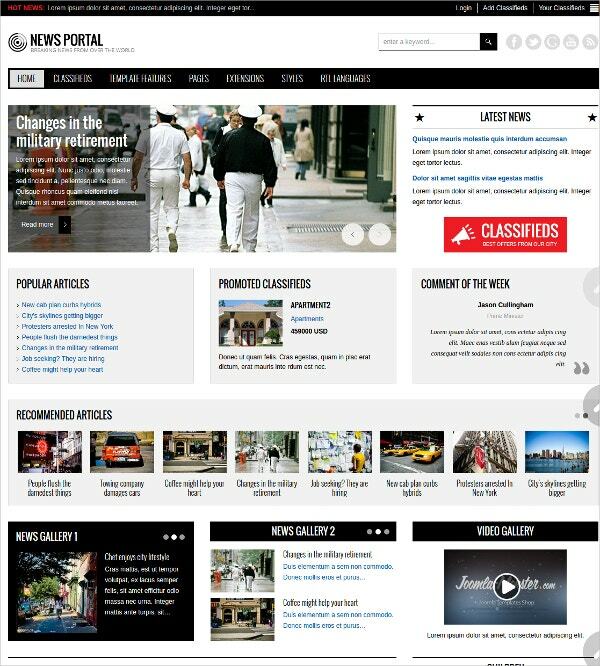 In this list, you will find the best premium Magazine Joomla Themes & Templates. 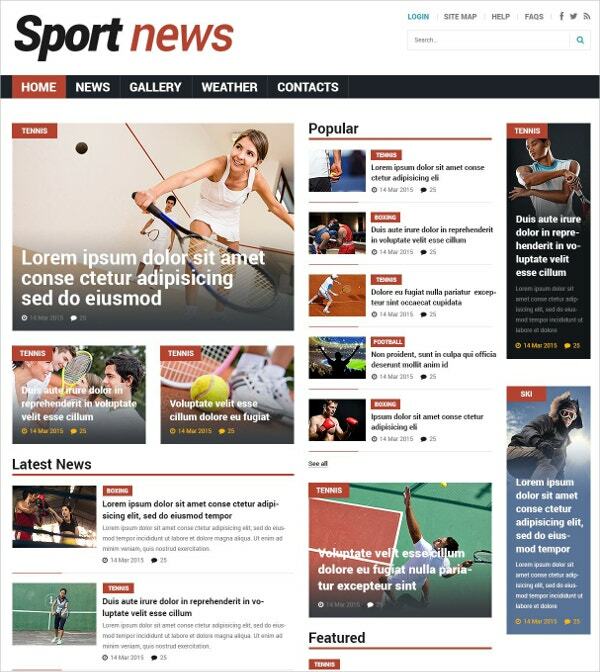 This amazing premium sports news Joomla template with great design is easy to install and configure. It runs with tons of backend customization config options. It would not take much time for anyone to customize this template to suit their other sports news requirements, all one needs is good images. 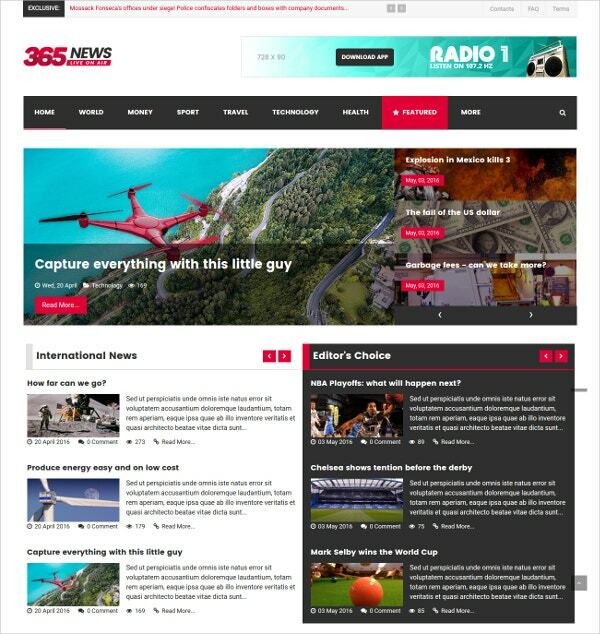 365News is a modern, news-oriented Joomla template built on the powerful Gantry 5 framework and comes with a strong documentation. This template is suitable for every news, magazine and blog site. 365News uses RokSprocket, SP News Show and “Slideshow (Joomla)” Particle which fetches Joomla articles automatically. People love to gossip and celebrity blogs are among the 1 spot to check this out. Their styling, clothing, way of speaking have always been of interest to the audience. Web users can keep track of the latest celebrity gossip with the help of this template. It is mainly about the use of images and photo galleries. Don’t hesitate to pick this theme. Magazine Blogging Joomla Theme is a modern and responsive magazine Joomla 3 template for blogging purpose. This template comes with some amazing features like unlimited colors, drag and drop page build with more page elements, smart way page scrolling with ON / OFF option and much more. This fashion blog template speaks of glamor and style from every corner and would be an apt frame for your fashion site. You are getting a suave, organized and super-smart responsive template for fashion site where you can include a great range of sections on your homepage such as news, latest trends, fashion etc. 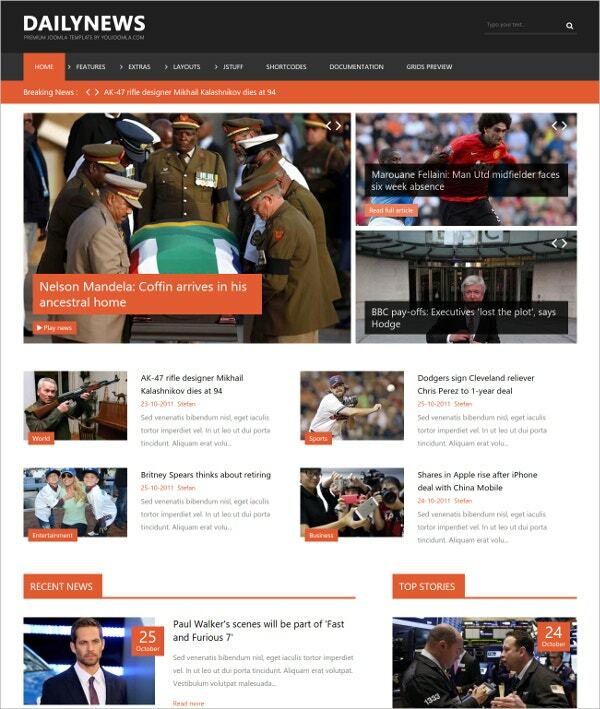 SJ TheDaily is a new Responsive Joomla 3.x Template news/magazine template. SJ TheDaily is built based on the latest YT framework V3, and is totally easy to use and customize. Besides K2 component, the template also uses latest web technologies like HTML5, CSS3… to adapt with the technology trends. JUX News is the perfect combination between design and communication – a responsive magazine Joomla template, news portal, blog and corporate websites, and for your site. It keeps the magazine feel on your site no matter what the screen size is. This template is cross-device compatible and makes your site look good, easy to access on any mobile devices. 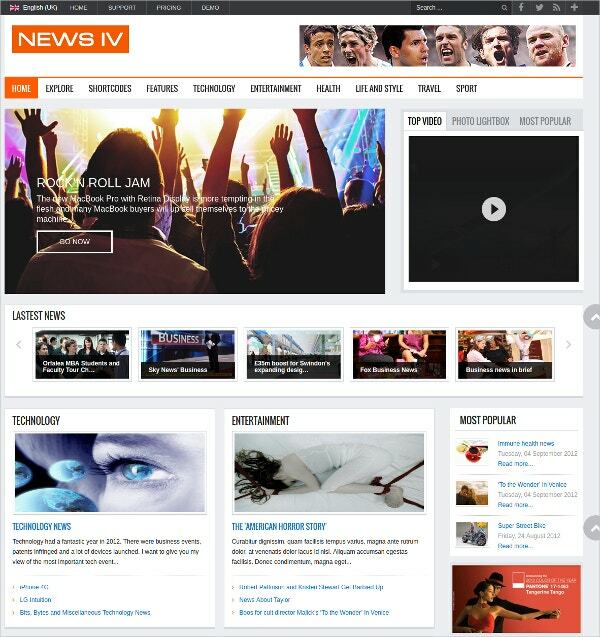 Above shown is the best Joomla multi-purpose news template that comes with a clean and elegant design. This template will help you to develop fantastic, professional and easy to use websites in no time. Try out the newest version of our information-packed template for reporters and journalists to bring the latest stories to the public eye. Reading news and magazine template nowadays is all about speed and mobile. 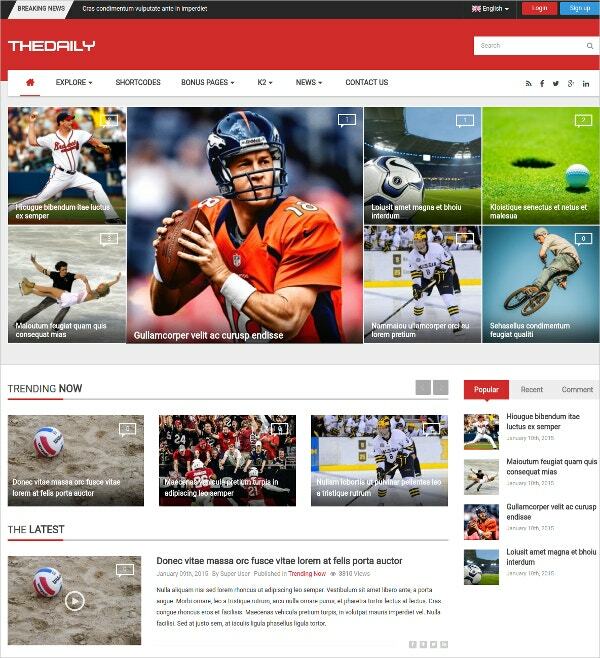 Teline V sports contain whole new flexible layouts with multiple content categories. It is for Joomla 3 and built with T3 framework, bootstrap 3, and Advanced Custom Module. 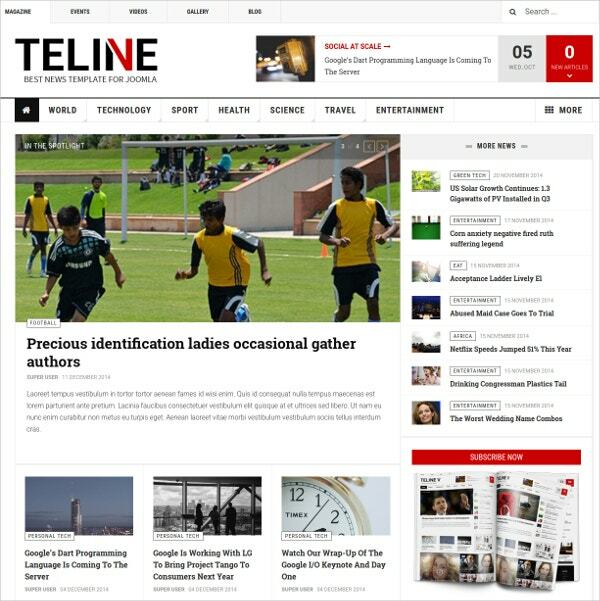 Teline V also helps readers with our new improved article view. 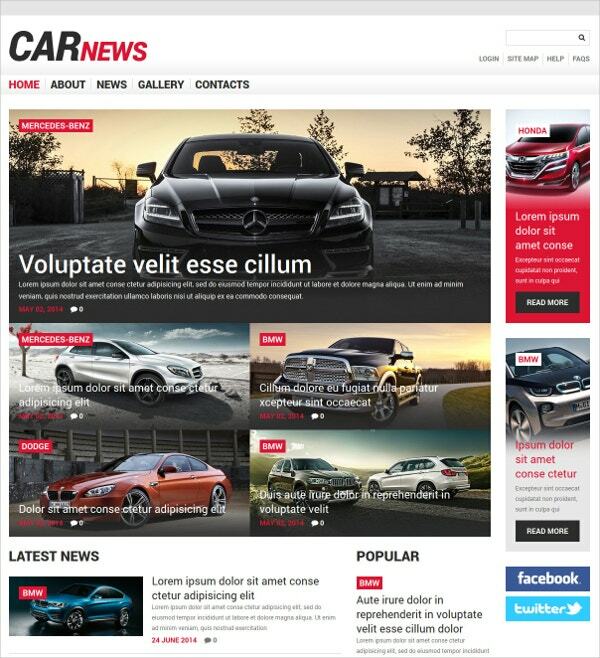 The modern design of Joomla Car news Template is a perfect fit for bringing your business online. The layout in contrasting colors speaks for the solid business ideas and products of the premium quality. Want to drive more customers in? Welcome them to the site with this elegant and safe design. This template with flat design style quickly conveys the information as well as helps your website load faster. 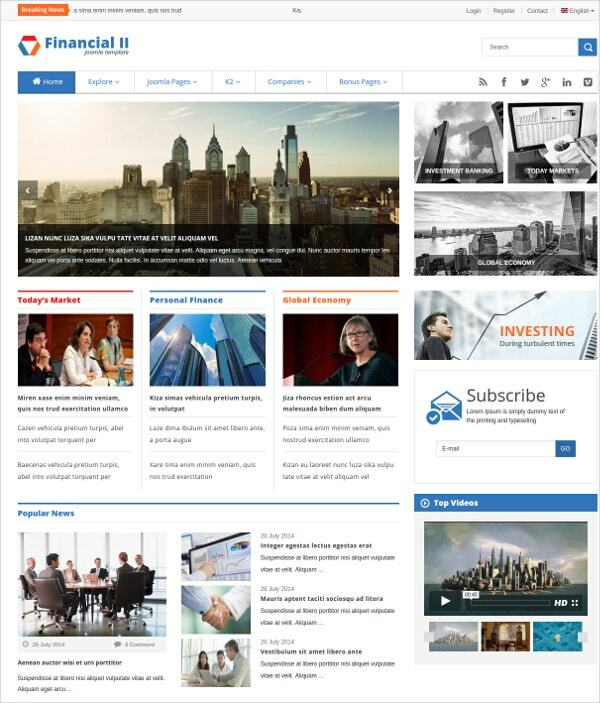 This template is integrated with K2 – a powerful content management component and equipped with many functional extensions and multipurpose bonus page. The template comes with 4 color styles and is flexible with Bootstrap3 at core. This fully responsive template for Joomla comes with everything you need to create an amazing website for your business. It comes with six built-in color styles for you to choose from. The design comes with built-in CSS styles and HTML overrides for the K2 extension which controls the blog at the website. You may also see Magazine Templates. 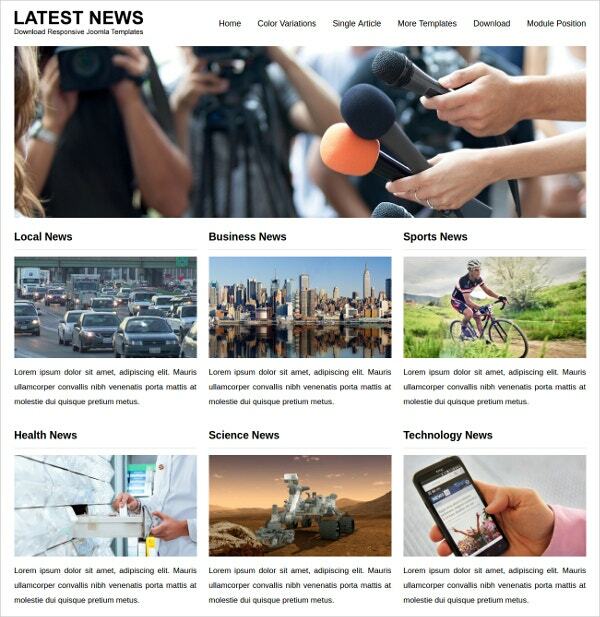 This amazing news Joomla template is a clean coded responsive Joomla template for general news, magazine, sports news or any daily life news. 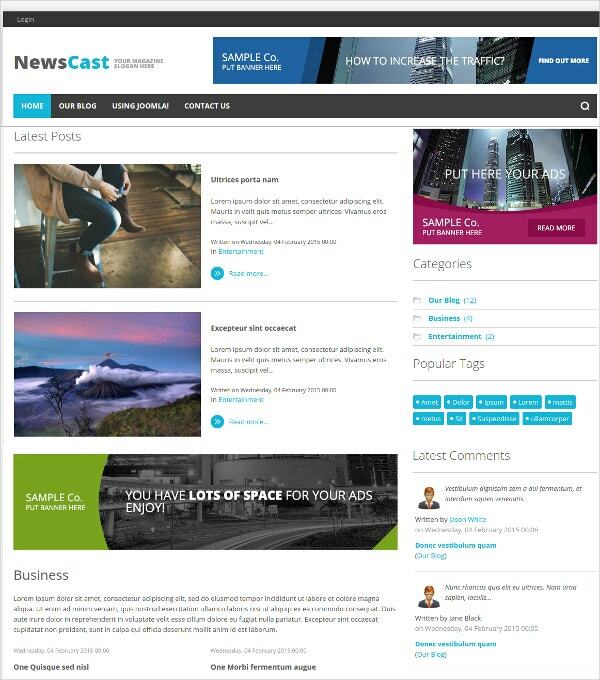 This amazing news template is built on YJSG template framework and features flat web design, 5 predefined color styles, unlimited styles option. 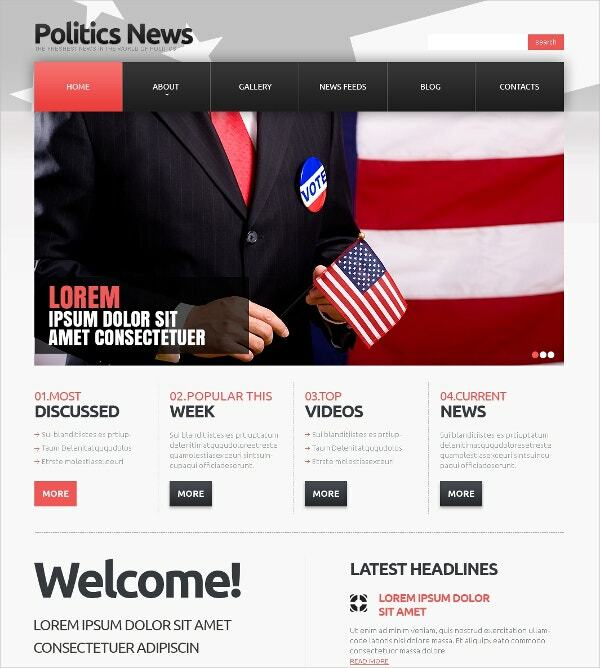 Website design professionals can use the Political news Joomla Template to create the dedicated web pages for political campaigns. The HTML plus JS, responsive admin panel are some of the major features. SJ HealthMag is a stunning responsive Joomla template that is built for launching a huge content news/magazine website. It is a modern, clean and professional design with well-structured layouts. It is built on YT Framework V3 and K2 component which gives it usage flexibility as well as customizing. Besides, the template comes packed with dozens of advanced in-house modules intuitive features: 2 homepage layouts, 5 color styles, mega menu, 65+ useful shortcode, etc. 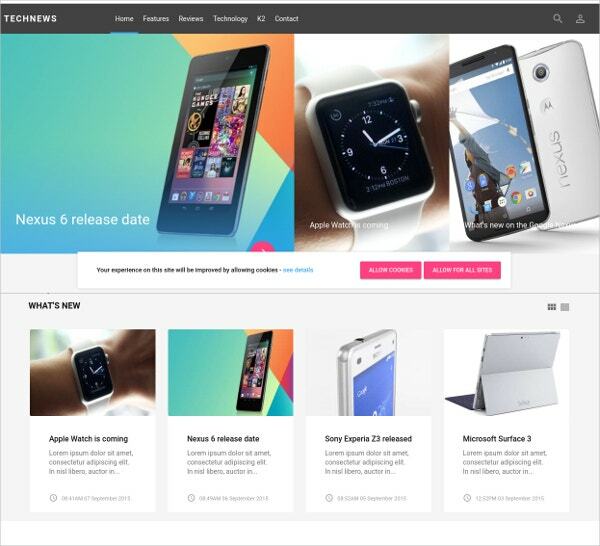 TechNews is a multi-talented Joomla template that can be used as a base for a range of magazine portal websites, overflowing with features including three header styles to pick from, post previews and a responsive layout that looks amazing on every kind of modern device. 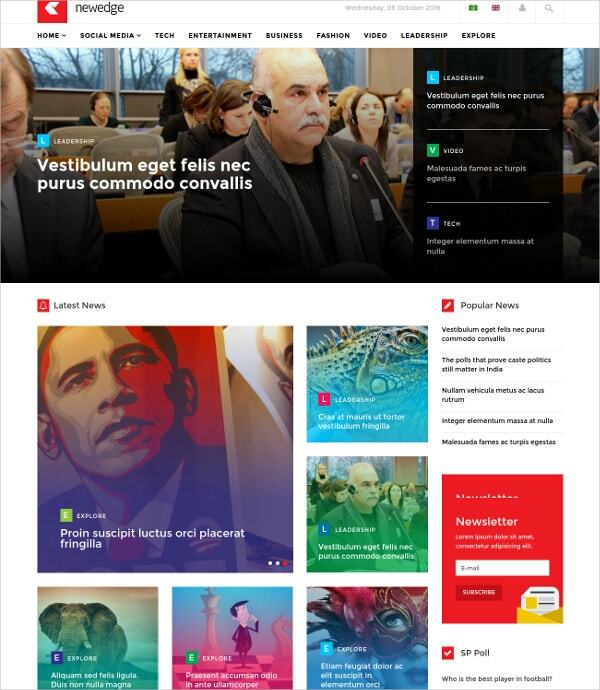 Responsive magazine Joomla template has a clean modern design and powerful admin options. 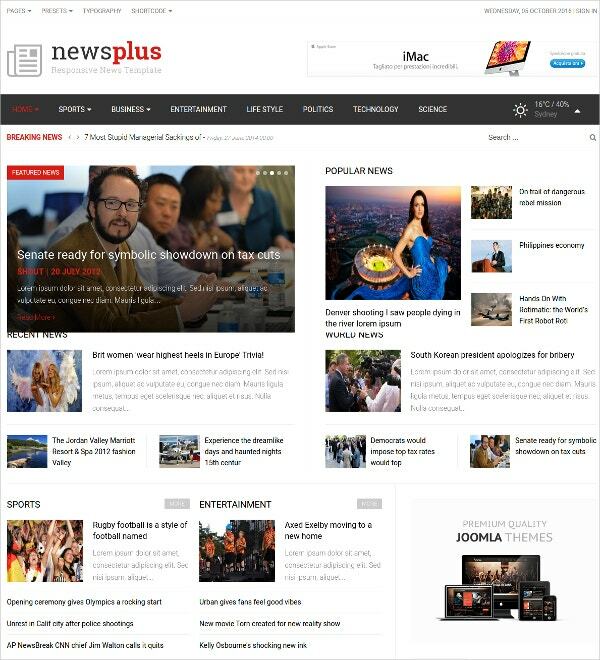 NewsPlus is highly optimized for both mobile and desktop platforms, fully responsive (RWD), we created it such way that template will automatically adapt the screen size of the reader’s device. With a built-in flexible drag and drop page module layouts (Helix v2 Framework)it will help in creating a fresh looking website that all of your visitors and your clients will enjoy it for sure. 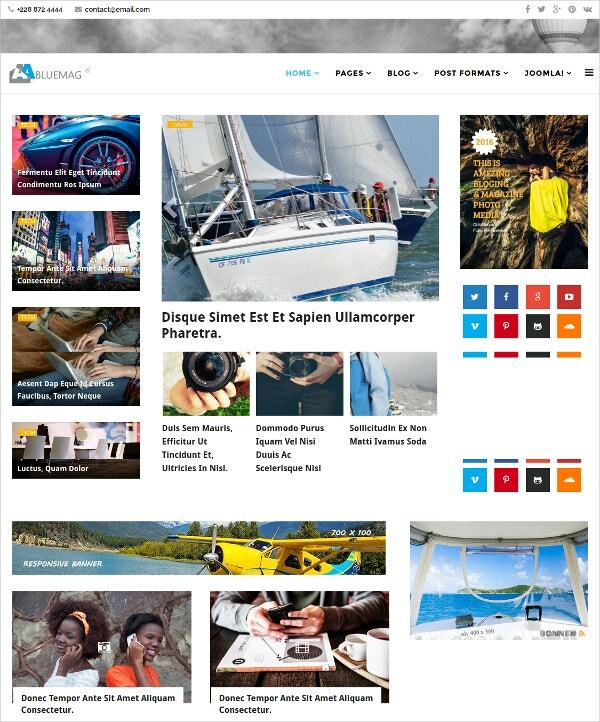 This awesome theme is the magazine Joomla theme. 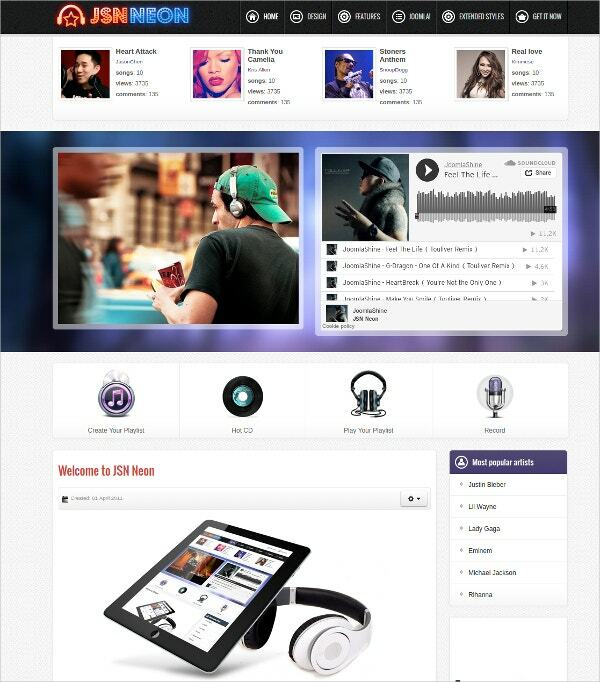 It is responsive to your browser and device and provides multicolumn layout. 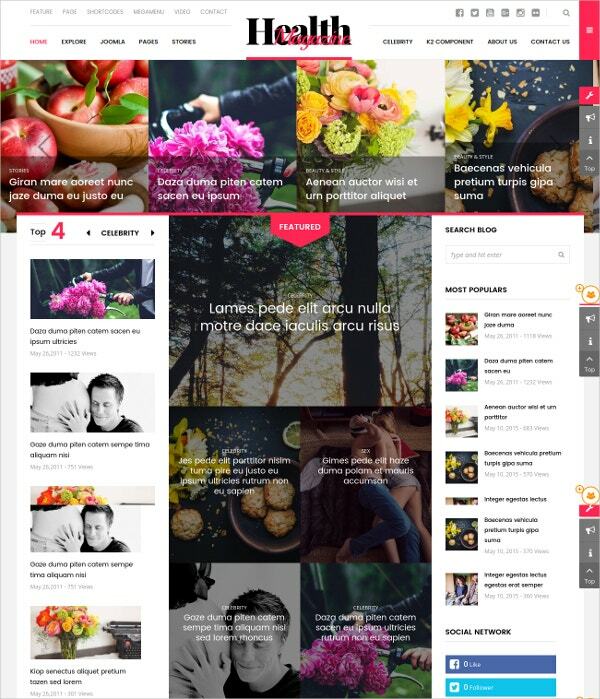 You can build your awesome magazine with this theme. The QuickStart comes bundled with SP Page Builder Pro along with 40+ addon elements. The site layout is available in 2 settings: wide and boxed. Equipped with the powerful Helix3 Framework and AcyMailing newsletter is ready for multipurpose use. 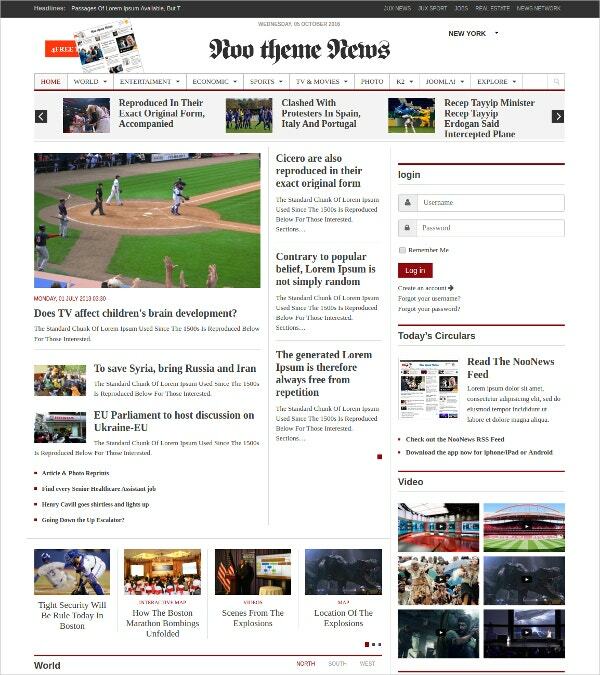 This template is a perfect suit for newspaper, magazine, publishing or review site. This template is fully mobile friendly and responsive Joomla template, can adapt automatically to mobile, tablet, desktop and kindle. Forget to make separate layout or content for any other screen and viewing devices. 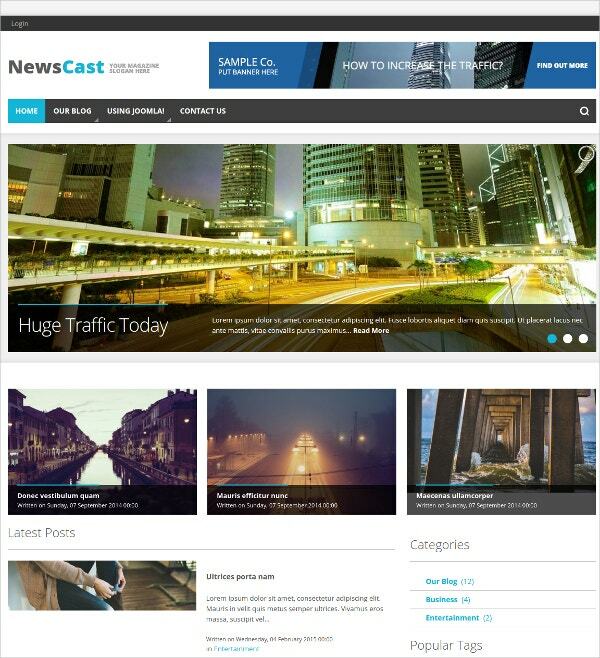 News Cast is a mobile-ready design that makes use of the popular K2 extension which is used by thousands of websites around the world plus it comes with lots of really useful built-in features to easily setup and customizes the design to help you create a professional, eye-catching website. This template is the online version of the newspaper and it is great for your new magazine or daily news update websites. 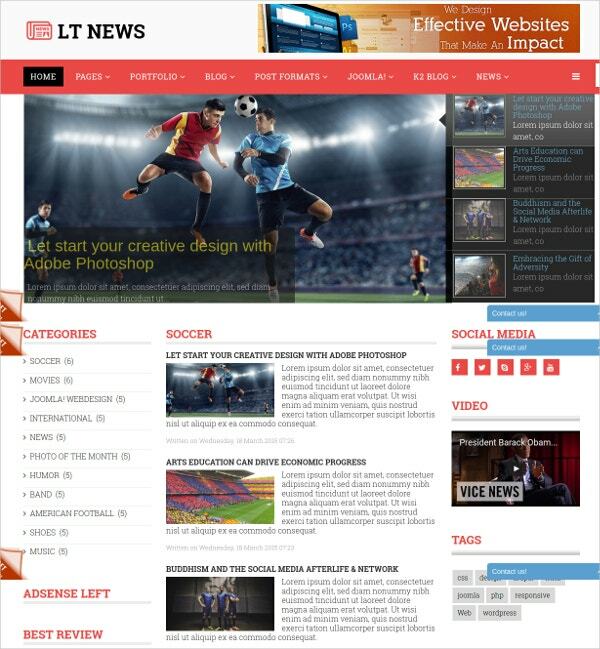 LT News builds on a powerful framework with 100% responsive layout based on bootstrap, unlimited module position, strong short codes help you present content. This is a pretty, clean, fast and flexible Joomla template, best fashion showcase and magazine, multiple styles and column layout. The OT Based on solid framework template provides complete control over the template styles, from width adjustment, google font, font colors, typesets, backgrounds, region and column layout. JSN Solid has the sharp layout with a remarkably clean design. 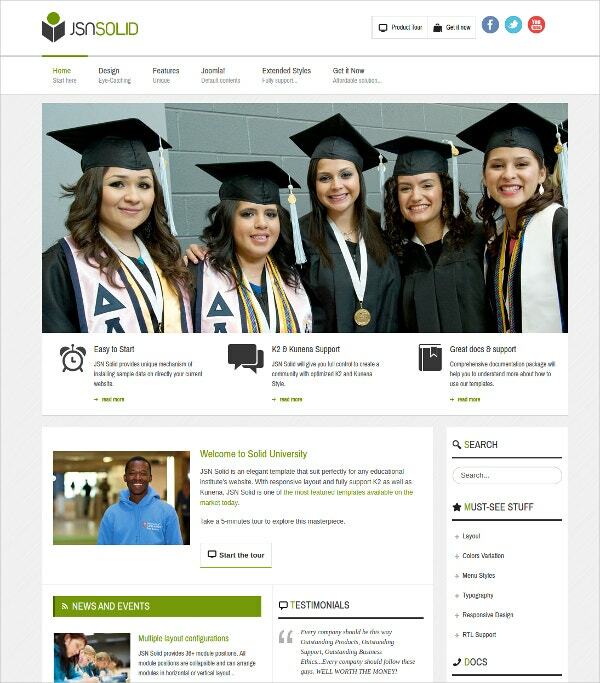 Exclusively designed for a school website, it is equipped with an extended style for K2 & Kunena. The users will get the most comfortable UX because of the powerful back-end and the responsive mechanism of this Joomla school/education template. 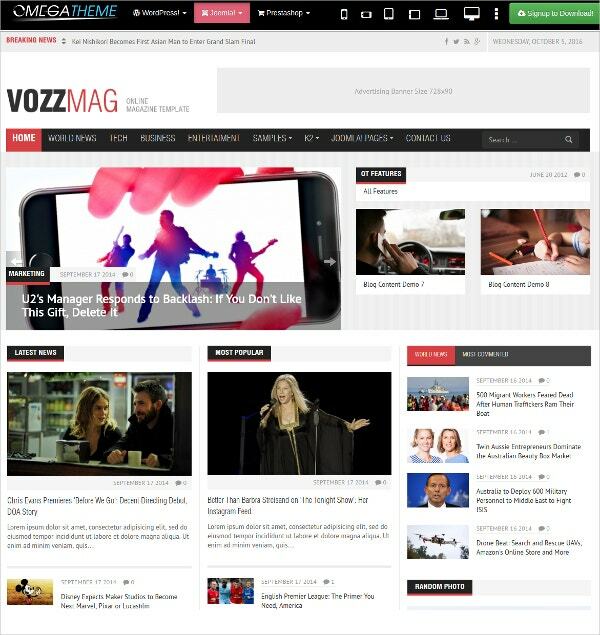 VozzMag is a new modern and clean responsive Joomla template which is suitable for magazine, newspapers, review webs, or blogs. The template is easy to customize and comes with various layouts and 26 module styles. By combining K2 content extensions in this template, customization process will be done easily, quickly and accurately. The graphic design is very light and minimalistic, and our multiple module designs give you the wide range of choice to select from and use for many particular modules. There are many powerful additional modules that work with DJ-Classifieds making a coherent whole, fully ready to create a professional website with classifieds. JSN Neon design is minimalistic with the modern and clean layout. Its sleek design will display beautifully on a wide range of devices because of the responsive layout. The need of creating a place for sharing and networking approached us to add the JomSocial extended styling to this stunning Joomla music template. 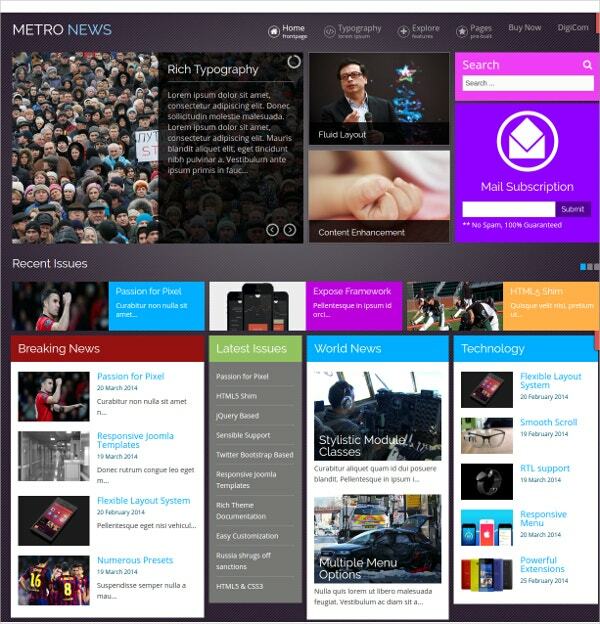 This responsive Joomla 3X latest news templates comes with 1200px 970px width. ZT News 4 is a fully responsive Joomla template that can be used for a variety of purposes, from a magazine to business etc. This News template is built in with 8 preset styles that can be used for any type of website. It comes with lots of built-in functionality which include powerful admin panel. You can find different types of Joomla themes that are crafted in a magazine style. We have made enough research to compile a list of top magazine templates and all these templates are depicted above. Pick up one of these quality affordable Magazine Joomla Themes and it’s certain that your news or magazine site will succeed.